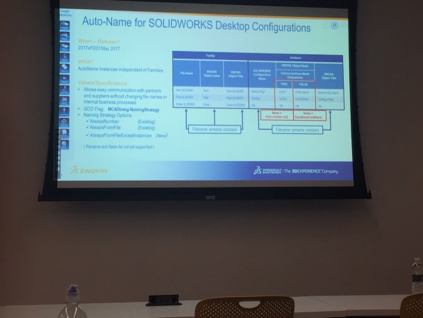 Earlier in May, I had the pleasure of attending an ENOVIA SOLIDWORKS user group meeting at the Dassault DELMIA headquarters in Auburn Hills MI. Engaging with user groups always provides us with new ideas and discussions about ways the market is using our solutions. I’m eager to share the photos I took from that meeting. I joined several xLM customers who described solutions xLM has built and deployed for them. First up was Lippert Components, a leading supplier of premium components to the recreational vehicle, manufactured housing, trailer, bus, marine and heavy truck industries. xLM Solutions conducted their SMARTEAM to ENOVIA (3DEXPERIENCE) migration and assisted with their ENOVIA implementation. Here is a presentation from Lippert describing the ENOVIA modules Lippert implemented. Next we heard from Regal Beloit. The company is a leading manufacturer of electric motors, mechanical and electrical motion controls and power generation products. xLM Solutions developed a tool to migrate SOLIDWORKS files from Windows Explorer to ENOVIA (3DEXPERIENCE). 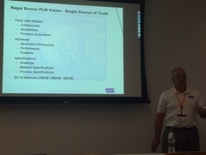 We heard from their PLM IT manager describing the company’s vision for its PLM implementation: A single source of truth. We also learned about future product features and enhancements from ENOVIA’s R&D Vice President, Kenneth Hallberg. 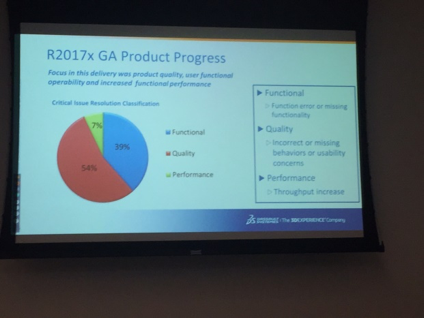 As you can see in the 2017x release of the ENOVIA SOLIDWORKS integration Dassault Systemes made great improvements in performance and quality. They also add new useful features like the ability to have the SOLIDWORKS Family objects named based file name while the SOLIDWORKS instance objects are based on an auto number value. 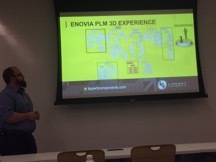 What was your favorite take-away from the ENOVIA SOLIDWORKS user group meeting?